Classic 1960s Wool Knit Suit | In beautiful, clean, unapolegetically wearable condition! Darling 1960s Novelty Print Dress with Jacket | Matching belt, original rhinestone buttons, cuffed sleeves and velvet trim! Simply Delightful 1930s Cotton Voile Floral Print | Hemmed on the bias for levity! Scrumptious 1960s Rayon Velvet Dress and Matching Dress Coat | Rhinestone button, pockets and gorgeous velvet! Announcement First, we're really glad to be here . . . and have been since the first of February 2018. If you are on the other side of petite, as in you passed by a size 1-4 fairly quickly in your youth, you are in the right shop! We work very hard to source vintage clothing that is wearable with contemporary sizing. We recently got lucky when we tripped right into a wonderful collection of vintage clothes that the bulk of were NOT size 2 -6. We gladly ship internationally, though we are not responsible for the VAT taxes. We’re liberal arts majors who prefer easy math so we, for the most part, always include domestic shipping. Our story goes a lot like this . . . Mary’s a tailor, Teresa’s a tinker. Mary brings a tailor’s expertise to vintage garments -- describing and measuring and expertly mending pieces as needed. Mary also brings years and years worth of experience liquidating entire estates in the Yakima Valley. Teresa brings 20 years of experience in the antique business and takes more than a bit of pride in sourcing unusual finds – vintage and antique items that are unique and, dare we say, rare. You’ll also find some common items here too . . . Things that tickle us. We both live and work in Yakima, a small town famous for soft fruits (pears, apples, peaches), wine grapes and hops . . . which are the basic ingredient for any and all craft brews. At present, you should be mindful of the 6 million, yup 6 million trees being planted in the Valley now. Why all the fuss in ripping out perfectly good orchards? The Cosmic Crisp . . . the single most perfect apple we have ever eaten, the perfect blend of sweet, tart, crisp all in one singularly scrumptious apple. And its vistas -- Mt. Adams and Rainier, proximity to outdoor recreation and a seemingly slower pace than the west side of the Cascade Range affords. We have traffic minutes instead of traffic jams. If there is ever a problem we will make every attempt at keeping you, our customer, happy. It’s just that simple! We could write a list of the dos and don’ts with a lot of policy written in stone . . . but it’s just not us. We take every single transaction, here on Etsy as well as in-person at vintage markets and in the brick and mortar shops we sell out of as it comes, and as it is . . . the single most important thing in need of our attention in the moment. If it takes a series of emails, questions and answers, additional photos for you to get the information you need please don’t ever feel like what you are asking for is an inconvenience to us . . . the pleasure is ours. Really! It's not uncommon that our customer's teach us something along the way . . . which is one of our primary goals . . . learn something new every single day! And no, there are no silly “re-stocking” fees. It has been your good fortune that our network connected us to several amazing collections of vintage clothing, sourced over years and years, all dating to the late 1800s through the 1960s. The work of now elderly individuals who amassed a collection simply for the love of the hunt, their profound appreciation of the fabric artisans hand work in the late 1800s and early 1900s and the history of fashion in the US. It is their labor of love that you, our customer, are now the benefactor of. All of our measurements are in inches and are approximate and we take them with the garment lying flat, on a flat surface. We encourage you to measure yourself carefully and keep your measurements handy. As for non-clothing items it will be quickly apparent that we prefer items that are older than us and the 1950s. Our favorite decades begin at the 1940s and go back in time from there. We enjoy color . . . delphite, jadite, chintz of old. Show us a near perfect vintage tablecloth from the 40s and 50s with those delicious reds and greens in the fruit or floral pattern and our heart's skip a beat. We consider condition to be paramount and while our items may show wear, the wear will be described and photographed for your consideration. First, we're really glad to be here . . . and have been since the first of February 2018. 1940s Black Tafetta Dress | Velvet buttons and collar and a full, 240 inch circumference, skirt for twirling! 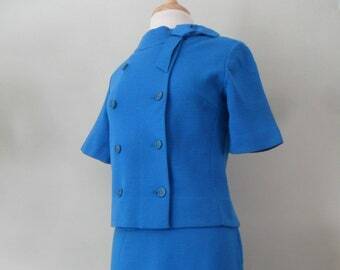 1960s LilliAnn Suit | Wool crepe, tucked neckline detail, original rhinestone buttons with bound button holes . . . auh, details! Victorian Lace Blouse | Silk underblouse, hand satin stitch detail, all original carved shell buttons! 1960s Cocktail Dress in Knit and Velvet Looking for a Date . . . with a reservation at Thirteen Coins at SeaTac! Pretty in Pink 1950s Silk Chiffon Party Dress | Satin waistband, back drape detail . . . simple and elegant! 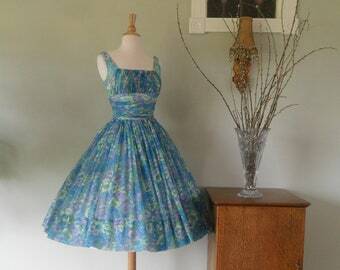 Darling 1950s Sleeveless Dress | Pansy print, full skirt and gathers galore! So so lovely and fits beautifully! It came with the cutest note and wrapping, it felt like Christmas! I can’t wait to wear it! Darling 1960s Dress in White with Bolero Style Jacket | Faux fur cuffs and a bow too! 1960s Dress Coat in Beige | Straight lines, original coat buttons, faux pockets and side seam pockets too! It's always about cat eye glasses, even when you're a farm dog. Sometimes it's about playing soccer with a big horse. 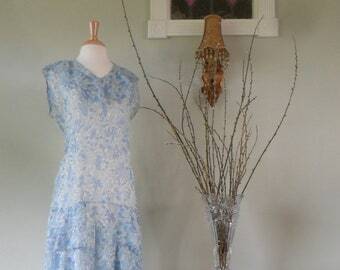 And, it's always about vintage textiles -- tablecloths, quilts, clothing . . . ! Our little ETSY shop sits on a knoll that over looks the fruits of the Yakima Valley. We have made our living in the antique business for nearly 20 years and have LOVED every single minute of it - the people, the learning, the old things! Find Cateyegirls at the following upcoming market! If you love all things vintage, this is the happiest place on earth for 2 days! An event that if you were ever inclined to visit the Pacific NW / Inland Empire, this is the weekend to do it. We are back this year with three truck and trailer loads full of vintage joy and, yes, we will be sure to pack some vintage clothing.